Weddings Costs > How Much Do Wedding Cupcakes Cost? Wedding cupcakes can either be served with the wedding cake or can replace the wedding cake entirely. Wedding tradition is constantly changing and this is just one of many aspects of a wedding that can vary. 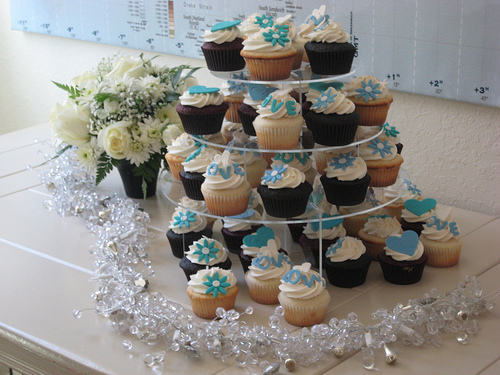 Wedding cupcakes can look like a wedding cake since the cupcakes are usually placed on pedestals of different shapes and sizes as seen in the picture below. There are several advantages when using wedding cupcakes compared to the traditional wedding cake. For starters, there will be a variety of flavors that can be served since each one is made individually, and the second advantage is that there is no need to slice. Guests will simply be able to go up to the table, grab one and walk back to their seats. The costs of wedding cupcakes depend on the number of cupcakes needed, the bakery being used, the flavor, the decorating options and geographical location. On average, cupcakes for a wedding can range anywhere from $1.60 to as much as $8 per cupcake; however, from our research, most spend $2.50 to $4 each. Mini cupcakes can often be in the $1 to $2 range, while an average-sized cupcake can cost $2 to $4. Center-filled cupcakes can cost $4 to $6.50, while larger-than-average cupcakes, sometimes referred to as a mega cupcake, can cost upwards of $5 to $8 each. Refer to our table below to see what some areas were charging, on average, for wedding cupcakes at their bakery. According to this WeddingWire.com forum thread, a few people chimed in and talked about what they had paid for cupcakes. One member had paid $285 for cupcakes and a small six-inch cake on top, which was enough to serve $65 people. Another forum member said they were doing eight dozen cupcakes in three flavors, along with a six-inch cake, for $275. This price didn’t include the delivery or the setup. This MyBankTracker.com article says the average wedding sees about 150 to 200 people in attendance and the average cupcake can cost $375 to $525 for this size party or about $2.50 to $3.50 per cupcake. Before the wedding begins, a representative from the bakery will be able to meet with you to let you sample, design, add extras, and create the exact setup you want for your special day. Most cupcakes will be unique and designed according to the customized order. Some may charge you for this tasting, while others may waive this price if you confirm the order. For example, Molly’s Cupcakes charges nothing for a complimentary tasting. Most bakeries are able to match the colors of your wedding theme and/or decorations to create an elegant look, such as white sugar pearls, chocolate curls or fondant decorations. Common flavors you will find can include chocolate, vanilla, red velvet, carrot, banana and vegan alternatives. If you were to purchase a center-filled cupcake, options could include cake batter, cookie, chocolate, peanut butter, peach, blueberry and raspberry, coconut, caramel, lemon, strawberry and mint. Most bakeries, according to our research, offer anywhere from 10 to 20 flavors. If you want to use a particular bakery, then most will ask for a non-refundable deposit, usually $100 to $300, depending on the size of the order. Renting a display stand/tier that holds the cupcakes can range anywhere from $20 to $50. If you were to purchase on, the costs could be in the $15 to $50 range, depending on the brand and complexity of the tree. See these Amazon.com listings, for instance, to see what you may have to pay. Additional toppings, such as candy sprinkles or chocolates, will often be considered an added cost for each cupcake purchased. The price can be anywhere from $2 to $5 per dozen. Premium toppings such a chocolate curl or fresh fruit could be much more. If you want to add a personal touch and add either custom flavor, color or writing on each cupcake, then the costs could increase by more than $1 to $4 per cupcake, depending on the amount of work that needs to be done. Hill Country Cupcakes, for instance, can decorate 40 cupcakes per hour and charges $25 per hour to do so. If the cupcakes have to be delivered to the wedding venue the day of, an additional delivery charge may be required. Depending on how far the bakery has to travel, this can often be in the $25 to $35 range or much more if they have to travel further than 10 miles. Setup, if necessary, can be an additional $20 to $40+, depending on the size of the display. Most experts recommend one standard-sized cupcake per guest at your party or two mini cupcakes per guest if you choose a smaller-than-average size. Some bakeries who work for weddings may have a minimum order before they work with you. Be sure to ask about this before setting up an appointment to taste test. Volume discounts often apply at most bakeries. For instance, if you were to purchase more than two dozen, then the costs could go down more than 20 percent on average. Taste test at least three to five bakeries before making a decision. As noted above, most bakeries will offer either a low-cost tasting or a complimentary tasting. Take advantage of these opportunities to ask questions, see their work and taste the actual product. Pre-set wedding packages will always be cheaper than customized options. Try to find a bakery where you can purchase the cupcakes as is and either serve the way they came or even consider decorating yourself. Consider going the DIY route if you don’t mind getting your hands dirty. BeyondFrosting.com, for instance, has a nice guide showing you how you can make great looking cupcakes for your wedding.